Energy saving performance contracts can help cities and counties fund infrastructure projects while bolstering sustainability. Public institutions looking to improve buildings and infrastructure in environmentally-sustainable, low-cost ways have an option of energy saving performance contracts (ESPCs). ESPCs are an alternative funding mechanism allowing federal, state, county and city agencies and K-12 schools and colleges and universities to pay for capital improvements. Rather than using traditional governmental appropriations, tax monies or borrowing, ESPCs use utility and operational savings. An ESPC works as follows: a public agency or school partners with an energy service company (ESCO). The company will develop and design the infrastructure, secure private financing to cover the up-front costs and install and maintain the system. The public agency will repay the private investors with the surplus funds generated by energy savings over the life of the contract. The ESCO guarantees these energy savings — if they fall below expectations, the ESCO will pay the difference. Renovate aging buildings and infrastructure including metering and controls, lighting, HVAC, central plants, windows and roofs. Update or add technology and security systems including IT enterprise systems, voiceover IP and fiber-optic networks. Improve sustainability with energy and water conservation measures including renewable energy sources or rainwater harvesting. These contracts can positively impact both the local economy and the local environment. 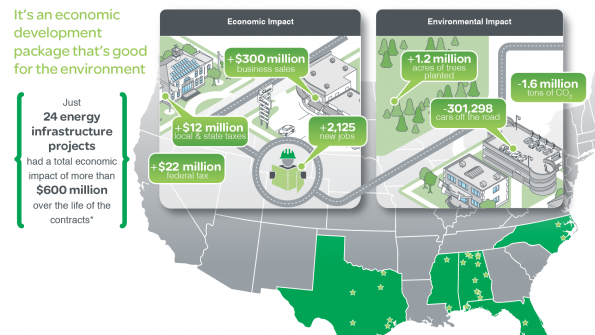 Schneider Electric, a multinational firm specializing in energy management, has helped more than 550 clients save more than $1 billion using ESPCs. One of these clients is the city of Denison, Texas. According to a case study, Denison needed to renovate several municipal facilities, including an aging, inefficient wastewater treatment plant. Other facilities needed to replace outdated HVAC and lighting systems. In 2012, Denison signed a $7.9 million, 15-year ESPC slated to cut city energy costs by 20 percent. The partnership between Schneider Electric and Denison facilitated several improvements at the wastewater treatment plant, including replacing failed control gates, replacing a coarse bubble diffuser grid with a fine bubble diffuser grid and replacing three 250 HP constant-speed aeration blowers and four 105 HP maintenance-prone pumps with smaller, more efficient equipment. Throughout city buildings, occupancy sensors were installed to turn off lights in unoccupied rooms and inefficient T12 lamps and magnetic ballasts were replaced with T8 bulbs and electronic ballasts. Denison also installed a new citywide EMS system in 11 city buildings. This effort helped the city secure a $64,000 rebate from Texan regulated electricity and transmission provider ONCOR for HVAC and lighting improvements and another $165,000 rebate for process improvements to the wastewater plant. The city used the ESPC’s guaranteed annual savings — $217,727 each year — to help pay for improvements to municipal facilities, freeing up capital funds to use elsewhere.